Here at Practical Caravan we’re always keen to look at a new manufacturer, especially a UK-based one. So when we learned about the new Barefoot tourer, we were eager to get our hands on the first prototype. The Barefoot is a fully constructed GRP shell that was designed around the idea of retro tourers from the late 1950s, when GRP was first used. 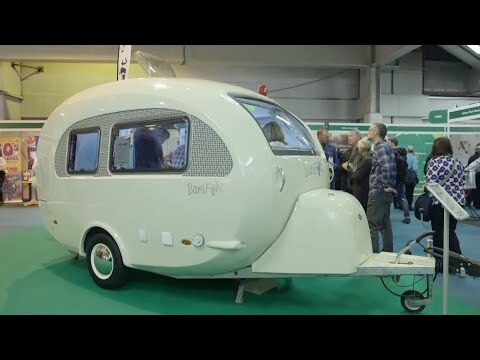 Cathy Chamberlain is the person behind the Barefoot: it was developed over four years from an idea she had for a small tourer that had to look distinctive, but was also practical to use. With help from four design students on an automotive and transport course at Coventry University, the Barefoot took shape. A team was put together and the project progressed. Built as a couple’s caravan, the Barefoot is a pure one-piece GRP shell with no joints, so leaks shouldn’t be a problem. The layout consists of a front wraparound-seating lounge area, while on the offside is a kitchen with a small dresser opposite. This van also comes with an end washroom that holds a built-in wardrobe; so the Barefoot packs plenty into its compact dimensions. The Barefoot’s GRP shell has lots of curves, and is a definite head-turner. It rides on a galvanised chassis, which was specially designed to keep the caravan low on the road. Alloy wheels were fitted to our test van, but these will be changed on production models to a steel rim with retro chrome disc. The production models will also feature AKS hitch stabilisers. The Barefoot comes with four corner steadies, all easy to operate and access. There’s no integral gas locker; instead, along with the spare wheel, the gas bottles are mounted on the drawbar. Smart stainless-steel grabhandles are well-placed and firmly fitted. The front polycarbonate window was designed to fit the curves of the caravan’s body, so it’s a fixed, non-opening unit. Service points are placed on the offside of the Barefoot, and it also comes with a 30-litre on-board water tank. The entrance door is also a GRP unit, but doesn’t come with a window, and no awning light is fitted. Customers will be able to choose from a range of exterior colours – our test model was in Cotswold Cream. As a smart, retro-looking caravan with a very high-quality finish, the Barefoot can’t be mistaken for any other tourer. The Barefoot’s interior is fitted out by Auto-Sleepers, so you’d expect it to look classy – and it certainly doesn’t disappoint. The front lounge area is spacious, and comes with wraparound and L-shaped seating. Thanks to the large front window and side windows (both of which open), the lounge area is filled with a good amount of natural lighting. The front window has curtains that are lined, while the side windows only have blinds and flyscreens. The main electrical box is in the nearside seat base. The seating is also cut away to allow for some extra legroom, but there’s still plenty of space for a couple to sit. A mains socket, USB point and 12V socket are placed in the lounge area to allow plenty of options for those with devices in need of power. There are also twin blown-air outlets in the offside seat base, powered from the Truma Combi 4e kW water and heating system, which should prove ample to keep the Barefoot snug. If you’re after a fully fitted kitchen you’re going to be slightly disappointed here, because the kitchen has a limited specification. However, it does come fitted with a smart Thetford hob and stainless-steel sink, with glass-hinged tops. There isn’t much worktop space, though, and a small extension flap on the side of the kitchen unit would definitely help here. A 65-litre fridge-freezer running on either 12V or mains power comes as standard, while a large side window and roof vent give good ventilation and natural light. LED illumination under the overhead locker would have been welcome, though. Two overhead lockers and a cupboard, plus small shelves, make up the storage here, and there’s a small drawer for utensils. The kitchen also has a mains socket, with the water-heating system controls located alongside it. Given the Barefoot’s diminutive proportions, the inclusion of an end washroom seems unlikely; but, thanks to its clever design, the Barefoot features a practical shower and loo arrangement. Okay, so you’re not going to be able to indulge in a spot of ballroom dancing in there, but it is entirely usable. The quality (GRP) finish is excellent, and the washroom also features a small window. The hand basin is crafted into the moulding; it’s not small, and the sink tap also doubles as the showerhead. A Dometic electric-flush toilet is fitted, and there’s a duckboard in the shower tray that can be removed if you want to add a couple more inches of headroom. Given that this is such a compact caravan, we were impressed with the design of the washroom. This is strictly a two-berth caravan, and it’s also designed with a double bed alone. You might think that the bed in the Barefoot is likely to be smaller than that of a normal-sized tourer, but it’s surprisingly spacious: once made up, it measures 6ft x 6ft. It’s also very easy to make up, too, and features a slide-out seat-base extension and beech slats. The bed should prove comfortable for its occupants: the seat cushions aren’t sculptured, and therefore provide a flat surface to sleep on. Its makers describe the Barefoot as having ‘lots of storage placed wherever possible’; as a result the caravan scores well in this category, particularly thanks to its overhead-locker storage. The kitchen has a large cupboard and a good-sized locker, too. Opposite the kitchen is the side dresser, with a large cupboard and overhead locker, plus some extra worktop space. The electricity control panel is located here as well, making it relatively easy to access. The wardrobe – also located by the entrance door – has a cupboard beneath, and is of a reasonable size. The washroom offers some storage opportunities in the form of a wall cupboard. Overall, every inch of the Barefoot is indeed used for storage capacity. The Barefoot is bespoke: you can choose from a variety of exterior and interior colour schemes. The quality is very good all round, with Auto-Sleepers responsible for fitting out the interior, and the van offers spacious accommodation for a couple. However, the high price will put it out of reach for many.